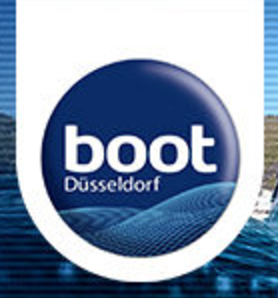 Discover the unique display of new boats at Boot Dusseldorf! Click on Join Us to learn more about complimentary flight packages and show tickets. The latest addition to the Azimut Yachts fleet in Malta. We are certain she's the most elegant addition to date. The new Dual Mode Hull generation. Smooth and unslammable, it ensures comfortable navigation and excellent seakeeping even in moderate sea conditions. The upper chine provides a large local beam at low speed while, at high speed, the flow separates from the lower chine which is shaped for least resistance, thus increasing fuel efficiency. The living area can be separated from the forward piloting and galley area for unprecedented privacy, surpassing even bigger boats. The crew can perform their work without having to access any of the spaces reserved for the boat owner and guests. Access to the side walkway is through a door in the galley, allowing the crew to reach their own cabins without crossing the saloon. Magellano 66 has been designed and engineered according to the highest standards applied in the recreational industry for production boats. With CE Class A and NMMA Certification, the boat is in compliance with the two major safety codes for boat under 24 meters. Speed or comfort ? Sporty lines or volumes ? Discover the all new Azimut Atlantis 51, dedicated to all those who do not like compromise. A pure open featuring an aggressive design and unprecedented space on board. For the first time in a 50 footer, three comfortable cabins and large below deck galley and dinette. The boat is powered by 2 x Volvo IPS 800 engines, for excellent manoeuvrability and speeds of up to 35 knots. This beauty will hit the water in 2019. The S10 will be the flagship of its class and will feature new design collaborations for the yard - the S10 comes from the boards of Alberto Mancini. Mancini’s work will be familiar to many, with the designer having previously collaborated with the likes of Overmarine, Fairline and Dominator. For the Azimut S10 he sought to combine the elegance of a sailing superyacht, the architecture of a modern seaside villa and the personality of a supercar. This can be seen in the flush decks, aft beach club and slightly lowered amidships cockpit, which will be the main social area on board the Azimut S10. Other key features will include fold-out terraces and exposed carbon fibre detailing, both in the pulpit and the central staircase. New Yachts Added to the Fleet! The Azimut Charter Club in Malta has re-designed luxury yacht charter on motor yachts. Whether looking to charter a boat for a day, weekend or more, our team at the Azimut Charter Club will work with you on a tailor-made programme designed to suit your needs. Our fantastic range of Azimut motor yachts, will enable guests to choose from a selection of 7 contemporary yachts, from 34 feet and upwards. All yachts are skippered by qualified crew and undergo regular professional maintenance. A brand new 250+ berth yacht marina within walking distance of the glorious city gate of Valletta, Marina di Valletta is located only a short drive from Malta International Airport and 15 nm away from Malta’s treasured coves and crystal clear bays. Safe All-Year Round Berthing for 250+ Yachts. 10, 12, 13.5, 15, 17, 21, 24, 28 metre, luxurious and beamy Berths. Alongside Transit Berthing available for up to 45 metre and 500GT Superyachts. Stunning location, set just below the majestic and recently restored historic Valletta fortifications. Floating Breakwater – 120m Long x 6m Beam. Up to 3.5T axle load for un/loading of goods alongside. Revetment (Boulder Breakwater) along Pieta Quay to dampen long waves (swell). Best in class 3 metre wide teak deck floating pontoons with digital water and electricity utility modules. 24-hour Marina Personnel / Security. Marina Office, WC, Shower and Wi-Fi facilities available. Concierge, Yacht Cleaning, Yacht Support and Guardiennage Services. 2,500 sqm, private, access controlled car park for 90+ vehicles. Luxury public walkway and landscaped promenade. Iconic Marina Clubhouse including new Marina reception, WC Facilities, Restaurant and private members’ roof terrace (estimated completion 2018). The New Azimut will launch its new high-style, high-tech, 59-foot S6 sport cruiser at this year’s Cannes Yachting Festival. The latest in the Italian builder’s S series, the three-stateroom, two-head boat features the glazed hull surfaces and distinct bow cap that make the series easily recognisable. It also features carbon fibre construction and three Volvo 550hp diesels with IPS700 pod drives for fuel efficiency, quiet cruising and fingertip-easy low-speed manoeuvring around a dock. With an exterior by super-yacht designer Stefano Righini, the Azimut S6 sports a low profile, highly raked windshield and equally low and raked radar arch. The interior is bright and clean with an elegant, contemporary European look, lots of open space and warm colours. Down four steps, the accommodations deck has a full-beam master stateroom amidships, with a queen bed angled out from the starboard side, across from two lounge chairs to port, plus an en suite head and shower. The VIP stateroom with another queen bed is in the bow, also with an en suite head and shower. A third, smaller guest cabin, with two beds, is to starboard. The hull of the Azimut S6 carries 15.5 degrees of dead-rise at the transom. The company says the top speed is 35 knots, cruising speed is 30 knots. The Azimut 60, now in Malta, raises the bar for excellence and is set to become a new icon in its category. Style, design and innovation come together in an incredibly appealing cocktail that is bound to chart a new course through the waters of the international yacht market. Interiors are designed by world renowned architect Achille Salvagni who uses flowing lines and streamlined shapes to reinterpret various classical features. The Azimut 60 can be viewed at Marina di Valletta and is availble for sea trials upon request. In order to stand out in a crowded marketplace, one needs to deliver something exceptional and innovative. In the boatbuilding arena, new designs arrive all the time. Few come with the pedigree of Nautor’s Swan, the design talent of Juan K, the trusted organisation of ClubSwan and an existing, unrivalled racing programme. The ClubSwan 36 counts on all four. The ClubSwan 36 is more than just a new boat. It is a statement. Fusing the best attributes of dinghy and keelboat sailing with the exhilaration of foil assistance makes this yacht the most innovative entry-level one design sports boat of its era. It is a clear message that Nautor’s Swan is looking to the future as much as its past in the desire to open new owners to its products and the ClubSwan world. It is proof of the burgeoning appeal of the Swan regatta programme and, in particular, Swan One Design racing. Esprit Yachting is the official dealership and authorised service point for Azimut Yachts, Nautor's Swan and Williams Performance Tenders. Since 2007, Esprit Yachting has provided professional yachting services, ranging from the commissioning, delivery, yacht care and cleaning, guardiennage, after sales support, mechanical and electrical services, yacht charter operations and OEM approved winter servicing programmes. Learn more about these brands represented by Esprit Yachting by clicking on the icons below. 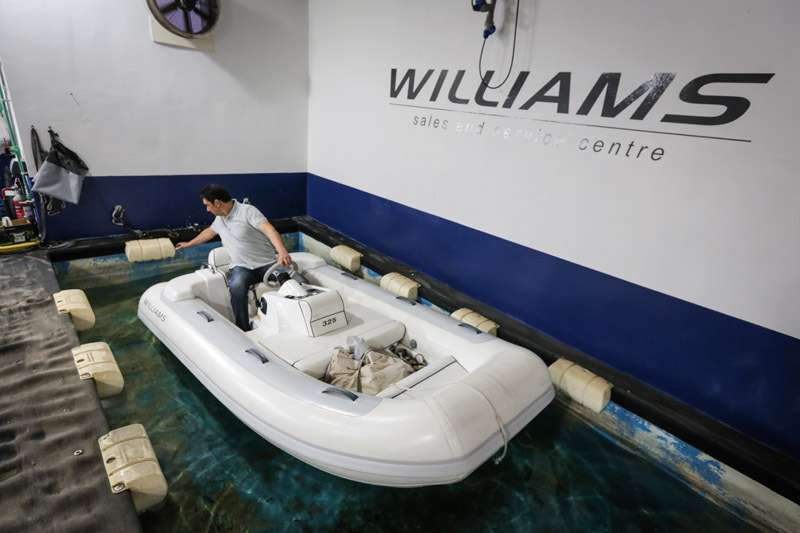 In order to provide a better service offering to our customer, our service division keeps evolving and is now made up of four full time, dedicated and fully qualified service engineers, who apart from having a passion for the boats they maintain, have been specifically trained to cater for, and recommend, any repairs necessary on all Williams Jet Tenders models. 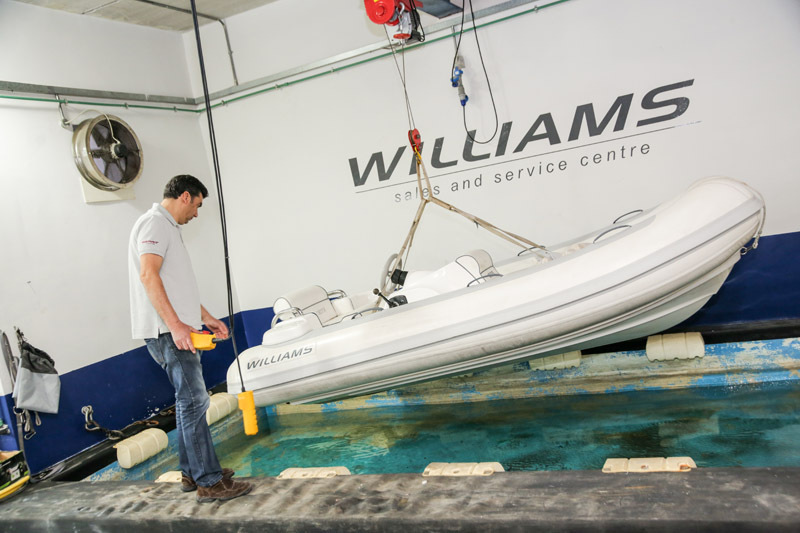 Our team operates from our purposely built facility in Qormi which allows also for on-water testing procedures which are carried out after every service to ensure that work carried out meets the high standard set by Williams. The Williams Service Team will also make their recommendations for any additional repairs which we may deem fit. Recommendations are discussed and works are only carried out once a client is satisfied and approved our recommendations. The Williams Service Team is at your disposal and is able to also carry out tube repairs, fibreglass chips, upholstery repairs and optional general cleaning and tender detailing including tube waxing. We can organise collection and re-delivery directly to your yacht. STRAND MARINE started operating in 1990 as a boat importing company, importing boats under the LARSON brand name from the USA. Following the initial success, the company also branched out into the automotive market, mainly focusing on automotive batteries and lubricants. Since then, the company has become the local distributor for VARTA being the largest car battery manufacturer globally - together with Mannol lubricants. To offer a better customer after sales service, Strand Marine also imports a wide range of marine and automotive spare parts, ancillary boat equipment and offers the services of fully qualified engineers to service its clients with electrical and mechanical service, repairs and installations. 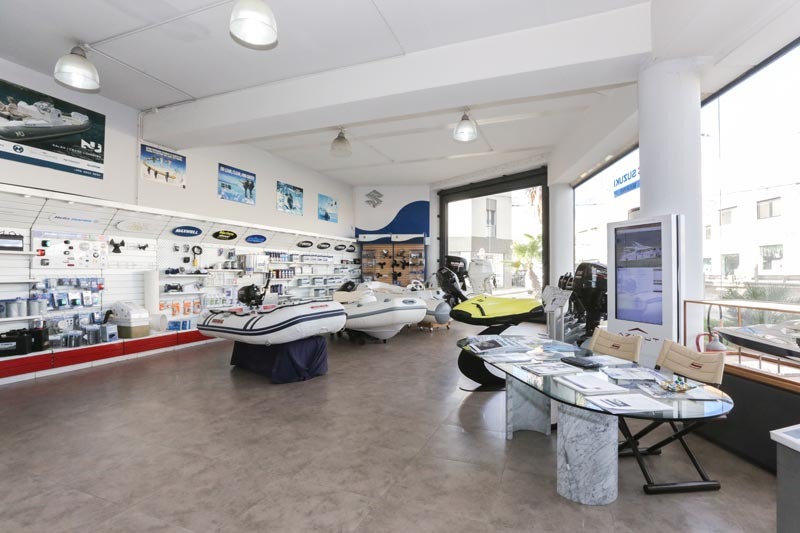 In 2005, Strand Marine opened a new 600 square meter state of the art complex, comprising of a showroom, repair centre, workshop and sales and administration offices. In 2012, Strand Marine further expanded its marine division with the acquisition of the SUZUKI MARINE dealership from Zarb Stores. 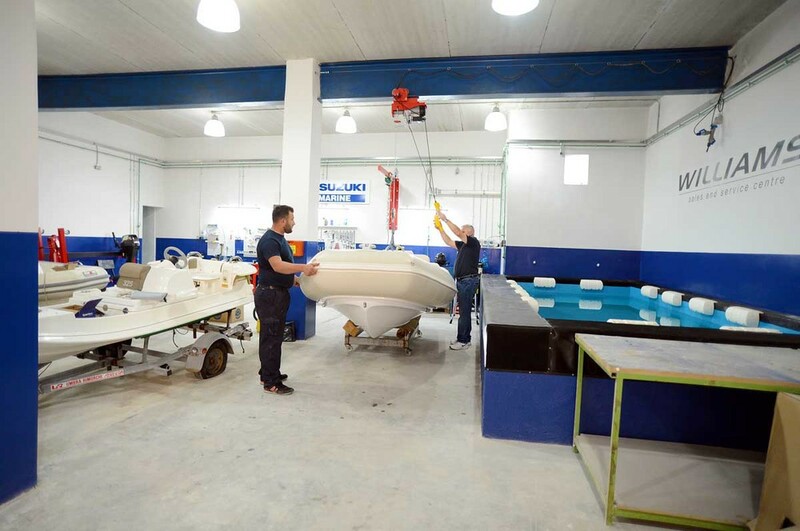 Along with SUZUKI MARINE, Strand Marine also acquired the dealership for NUOVA JOLLY ribs to complete the company's sales range and be able to offer a complete rib and outboard package to address a growing demand in this segment. 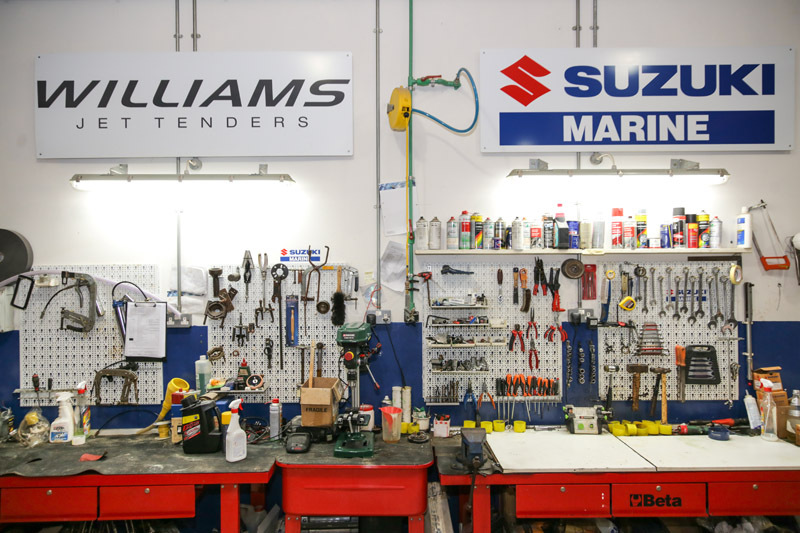 To further improve its after sales service, in 2015, Strand Marine setup a new 2,000ft SERVICE CENTRE, built to Suzuki's specification and featuring the latest Suzuki tooling and diagnostic equipment.